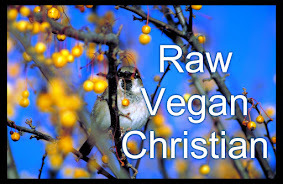 I really love raw cuisine, I like to make a lot of raw foods in the summer because there are so many great fruits and vegetables available at my local farmers market its hard to resist. This is a easy recipe to make, it just takes a little bit to make because you have to use the food processor three different times. You start out grinding the nuts for the base, then make the cashew filling and finishing off with the strawberry sauce for the topping. The cake does require resting time in the freezer to hold its shape so thats the hardest part of this recipe the waiting time for eating the cake. Start with grinding nuts in VitaMix, then add rest of ingredients till blended well, then press into the base of a spring- form pan. Process the cashews in the VitaMix canister and then slowly add lemon juice till well combined, then add rest of ingredients and slowly pulse till the coconut butter has melted fully. Set aside in a separate bowl. *Let berries thaw while making the first part of the cake. *Start with the dates in the processor till balled up, then add the thawed berries and blend till smooth. *To build the rest of the cake pour half of the cashew filling in the crust then use a flat pastry spatula to spread out, then add half of the sauce and repeats the first step then finishing with the rest of the sauce on top. Put in freezer for at least two hours to set. I like to garnish with fresh strawberries or raspberries and shredded coconut. Remove from spring-form pan and enjoy! Are you thinking about trying a raw vegan lifestyle but feeling a little unsure of what you might have to give up? 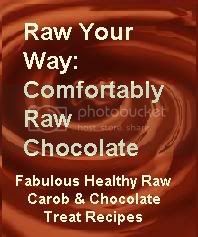 This recipe e-book is a fun and super delicious collection of healthy, nourishing raw chocolate and carob recipes. Go here to purchase this delightful collection for only $10 USD.